A history-making director, producer, and screenwriter, Roger Ross Williams has already garnered many accolades and awards for his amazing storytelling talents, including the 2010 Academy Award for Best Documentary Short Subject for his film Music by Prudence. Williams is the first African-American to win an Oscar for directing and producing a film. 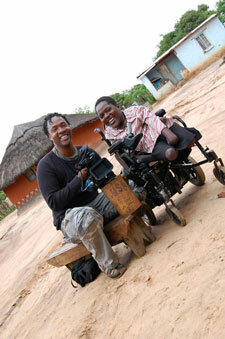 His latest film, God Loves Uganda, premiered at the 2013 Sundance Festival to rave reviews. Before striking out on his own, Williams was a producer of political satire for Comedy Central and Michael Moore´s Emmy Award-winning series TV Nation. His news credits include NBC Nightly News, MSNBC, The Today Show, ABC News, CNN, and the highly rated Barbara Walters specials for ABC. He is also the recipient of the NAMIC Vision Award and the National Headliner for Best Human Interest Feature. He had no idea where his imaginary life came from, but it appeared early in his young brain and he instinctively believed in it. Young Roger Ross Williams was a lonely latchkey kid. His mother was a struggling maid. They lived in a small, dingy industrial town in Pennsylvania—a town he always knew he’d leave. Every day after school he’d let himself in, pour his bowl of Cap’n Crunch, and build the houses his stick figure self really belonged in. Stick figure Roger took jet planes and limousines. He was admired, important and he thrived in the fancy big cities of the world. He was everything little Roger was sure he’d be someday, though he kept it to himself. All he learned in those “special classes” was that he didn’t want to be in them and neither did anybody else. At home, he moved further into his fantasy world, fueled by shows he saw on TV. Still, something in him just knew he was meant for bigger and better things. Back at school he’d gone from being “the chocolate bar” to “Uncle Tom,” because court-mandated busing was bringing in loads of new black kids, and he already knew the old white ones. Somehow Roger survived the rioting that ensued. To his mother’s delight, he somehow graduated from high school and started college. He put in some time at a state school where he “saw no one like himself. One day, he just packed up his car and left. Next came a community college near home. He wasn’t happy. Then audacious, imaginary Roger kicked in and cut loose. The Roger who’d always secretly believed in himself applied to the colleges he really wanted to attend. His life story, so well written—strained grammar and all—earned him a full scholarship at expensive, exclusive New York University. He came alive in New York City. Roger Ross Williams would earn the first “A” of his life in an NYU math class. He would also self-diagnose after reading an article about something called dyslexia. And he would discover his profession—journalism—doing an NYU internship in the ABC News library. Imaginary Roger kept coming to life. After graduating from NYU, Williams set out to become a man of the world, living first in Paris, then Geneva. He remembers being stunned that there were separate stores for coffee! And bread! And cheese! He was in heaven. Then he established himself as a journalist. As a segment producer, and then documentary producer, at virtually every network from Comedy Central to NBC News, he picked up countless awards. He worked with everyone from Michael Moore to Barbara Walters. At New York Times television, CNN and PBS, he developed his reputation as the go-to producer for the tough documentaries—the ones that required creativity. Each documentary demanded a written script, but he had a friend who’d clean up the grammar before he turned it in. He was masterful at the harder parts—figuring out how to tell the stories, shooting, structuring, and editing. His rapport with story subjects was as natural as breathing. But Roger Ross Williams got tired of being told what to cover. The confines of corporate story definition became claustrophobic. So Williams did (without hesitation), what ninety-nine point nine percent of his colleagues were terrified to do—he went out on his own. He remembers a flabbergasted principal grabbing for the mike, trying to wrench the message back to something more mainstream, while a pilgrimage of the awkward and the lost made their way to Williams in tears, seeking more personal contact. Williams was taken aback. They thought he had the answers… What he knew was that little Roger wasn’t stuck here anymore. And in his struggle to get out, his imagination had triumphed, and his inability to read had probably opened more doors than it had shut. Along with his partner, Roger Ross Williams resides in both New York and Amsterdam. His latest film, “God Loves Uganda,” about American-exported homophobia, made the shortlist for the 2014 Oscar nominations. 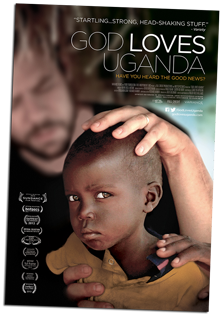 “God Loves Uganda” is currently in theaters (www.GodLovesUganda.com). 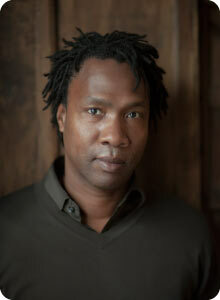 Roger Ross Williams has several new documentary films in the works. Nelsan Ellis almost didn’t find the Juilliard Drama School because he kept misspelling the search term. Somebody in his Chicago high school told him he should go there.